Every year I like to grow at least one plant I’ve never tried to grow before. It isn’t always a success, such as my luffa experiment, but it’s always fun. Last year, I chose broom corn because I knew I would be hosting a gathering in the fall, and I wanted a table decoration that would also serve as a conversation piece. It was a success on all accounts. After it pops up and in its early growth stages is the when it looks the most like corn. My husband and I were amazed at how tall it grew. Notice how it has no ears. As the name suggests, broom corn can be used to make brooms. We cut several stalks to dry in the barn. Our stalks were too curved to make a good broom which was okay by me since I wanted table decorations. I loved the decorations so much and they lasted so long, that I’ll grow more broom corn this summer. Give it a try. You and the birds will love it. This is the time we gardeners have been waiting for: harvest! One crop I love to harvest is potatoes. Digging potatoes is like digging for gold—especially if they happen to be Yukon Golds. Since there are only so many potatoes that can be eaten at once, how can they be stored without rotting? Potatoes need a cool, dry room with air circulating around them. At our home, our pantry is a cool, dry room but we still needed a container to allow air circulation. Here is the solution my husband devised. He cut some leftover wire shelving to fit in milk crates. He also found some metal strips to hold the shelving in place. This allowed us to stack our potatoes and add storage space when needed. It’s worked so well for us, and we didn’t have to purchase anything. I hope this idea will help you and allow to enjoy your vegetables longer. Because I’ve been so taken by the beauty of orchids but have been a bit intimidated by how to care for them, I’ve written two previous posts about them. Well, here’s a third post. Proflowers has been kind enough to share a link to its orchid care guide that is condensed, practical, and user-friendly. I love the guide and I think you will, too. Below is an introduction Proflowers has written about orchids and the link to the orchid care guide. Orchids have gotten a reputation for being difficult to care for, but with proper consideration of their natural environments they can be easier than you think! They generally grow in the tree tops of humid rain forests so make sure your home has adequate air flow, sunlight and humidity. If you are looking for specific care requirements for your orchid, consult this Orchid Care Guide by Proflowers. They also include tools for easy orchid care, basic requirements and best orchids for beginners. Thank you, Proflowers. It’s my sincere hope this will help everyone enjoy their beautiful orchids for a long, long time. Orchids are not only beautiful, but they may also trigger a wonderful memory. When I was a child, my mother always wore an orchid corsage to church on Easter Sunday. My brother would pick it up on Saturday from the nearest florist (twenty miles away), and it would be stored in the side door of the refrigerator. It was pinned on Mom’s dress after she had secured her hat with bobby pins and before she slipped on her cloth gloves. 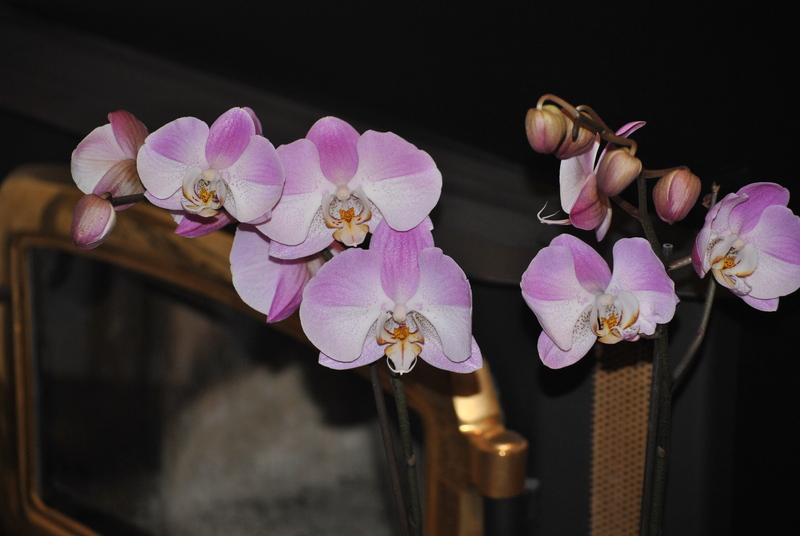 I have the most common orchid variety, the Phalaenopsis, not the type Mom wore as a corsage. For a wonderful look at the mind-blowing number of orchid types, check out a compendium of the orchid family created by FTD. Have fun checking out the amazing photographs. Perhaps it will trigger some lovely memories, too.